Theories of justice in general, and theories of global justice in particular, are characterized by their high degree of abstraction and their normative character. Their obvious affinities to specific options in political philosophy and social theory are often taken for granted and rarely explicitly addressed. This entails the risk of naturalizing certain social formations (for example, liberal-capitalist formations) without questioning their economic and social assumptions. The contribution of these theories only amounts to moral and political recommendations, which face insurmountable difficulties in how they are currently applied. This is counterproductive when these theories of global justice seek to address the challenges of migratory flows. Firstly, this chapter aims to relate the theory of global justice to a critical social theory that challenges the assumptions of advanced social capitalist formations. Normativity cannot be externally applied to a social reality that constitutively denies, subordinates and neutralizes any normative dimension. 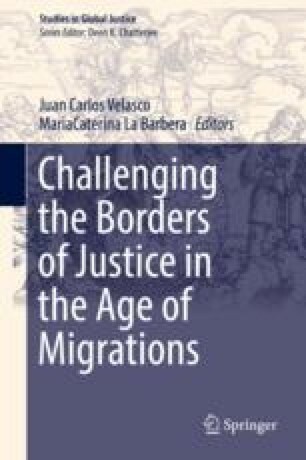 Secondly, the chapter situates the concept of territorial borders and their control of migratory flows within a broader framework that accounts for the significance of frontiers in the formation of the capitalist world-system. Thirdly, it analyses the concept of “migratory regime” as a key element in this formation. It also studies the specific migratory regime of neoliberalism and its crisis, interpreting them within the general structures and dynamics of the neoliberal mode of regulation. Finally, it tests some proposals for a global justice theory regarding migrations within the current crisis of capitalism. This contribution is part of a R&D Project entitled “Social suffering and victim status: epistemic, social, political and aesthetic dimensions” (FFI2015-69733-P), funded by the Spanish Programme for the Promotion of Scientific and Technical Research for Excellence. González Cámara, Noelia. 2011. Migrantes, procesos de irregularización y lógicas de acumulación y exclusión. PhD. thesis. http://digital.csic.es/bitstream/10261/49049/1/TD%20-%20Noelia%20Gonzalez.pdf. Accessed 6 Dec 2016.